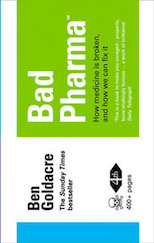 One thing in Bad Pharma has shocked readers more than anything else: the way that vitally important information about trials is withheld from doctors and patients, not just by drug companies, but also by government bodies such NICE and the European Medicines Agency (the body that approves and regulates medicines for the UK). As we know, The ABPI now claim, in the face of all the evidence, that missing trial data is a thing of the past. This is plainly and demonstrably untrue, as demonstrated in an earlier post: information about trials continues to be withheld from doctors and patients, this is an ongoing problem, and patients are harmed as a result. But back in the real world, while the ABPI refuse to engage constructively on this ongoing issue: regulators and academics are discussing how to move forwards and address it. On that topic, here is a great discussion paper from Trials, the open access journal, looking at the ethical issues around medicines regulators and NICE hiding data on behalf of companies. It sets out, as I do in the book, the disturbing ongoing story of how these government bodies currently withhold the results of drug trials from doctors and patients. It then explains the harm done to various players, including patients (who receive inferior and therefore harmful medical treatment), trial participants (who are exposed to unnecessary risk), health insurers and governments (who are defrauded by excess treatment costs), and research funding bodies (who waste scarce resources when they are misled about the current evidence on interventions). This is an issue that needs far more attention from journalists, and from politicians. It cannot be neglected. So I recommend the paper very highly, and I think it is tragic – for patients, and for all the ethical professionals working in the pharmaceutical industry – that the ABPI continue to claim that trial data is no longer withheld, in the face of all the evidence. Meanwhile, everyone else is working constructively to move forwards on this vitally important threat to patient safety. I think the ABPI do their own members a great disservice by burying their heads in the sand, and claiming that night is day. FWIW, this problem was explored in the popular media in 2004 on the US television program Law & Order in an episode called Coming Down Hard. I’D LOVE TO READ YOUR VIEWS ON EMA WORKSHOP !!!! I’m speaking at this workshop. The content here is very informative and well researched.